The view should be of the park across the road from where I live. Option 2 is that the cam has reset itself and is dozily pointing upwards. 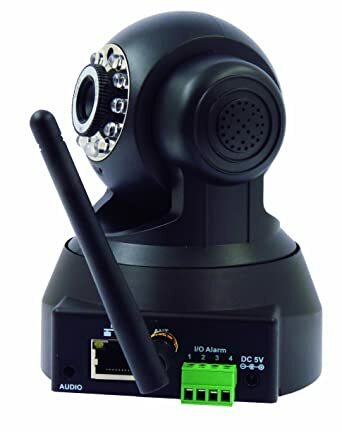 This one of the first IP Cameras to retail (well) below the £100 price point and is packed with features not found on some much more expensive ones. I believe this camera is actually a rebadged “Foscam” before that brand made it over to the UK and so is functionally compatible with a bunch of IPCam software out there and hacking guides. The coolest thing for hackers is the rather conspicuous bright green GPIO port on the back of the cam (labeled “I/O Alarm”) that can both accept input to trigger the capture of an image and if motion is detected, fire an output.